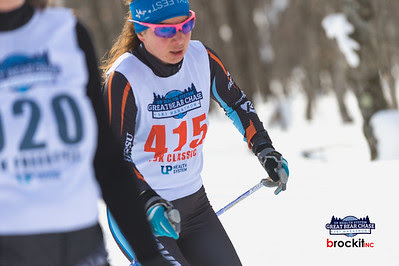 We kicked off our March Ski trip with the Great Bear Chase Ski Marathon. 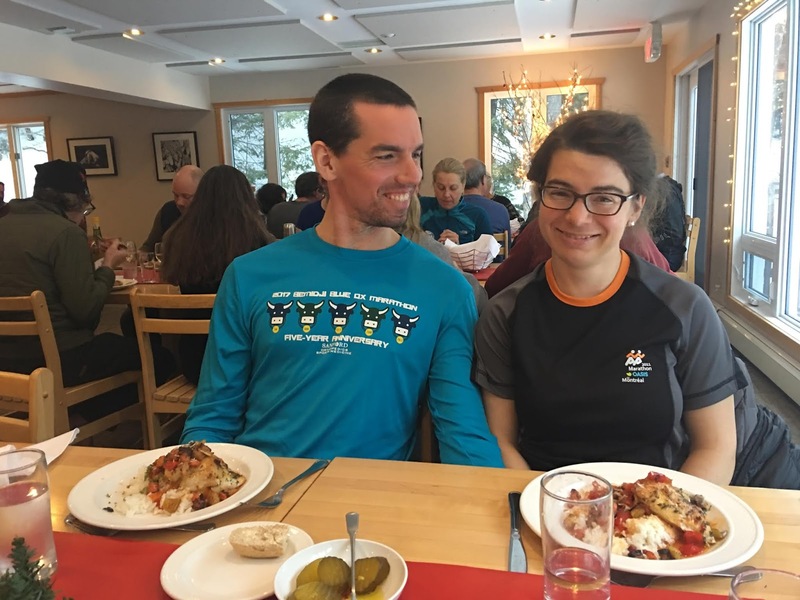 As I previously mentioned, I decided to do the 50 km classic to best prepare for the best post-race meal offered by any race. Looking at last year’s race results, I knew I had a decent shot at winning the classic which both adds some extra pressure and excitement! Conditions looked pretty perfect- a start in the mid-teens warming to the mid-twenties. 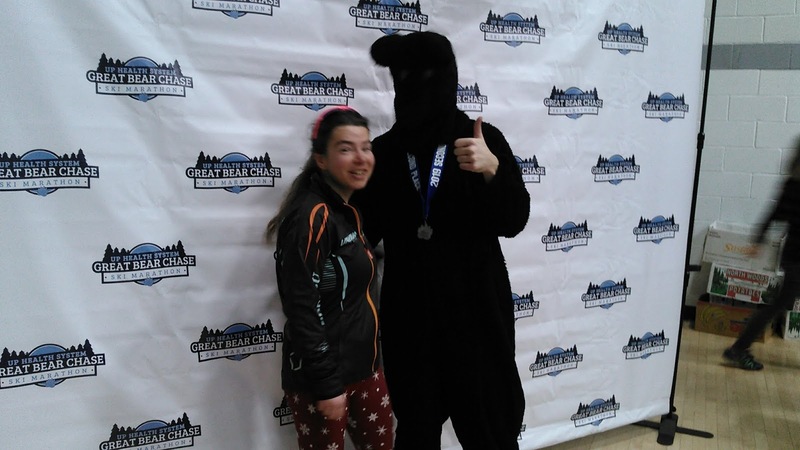 I wore a layer of long underwear on bottom, my sports bra on top, and my spandex suit. The race had spandex bibs this year which was nice- no having to worry about the bib coming undone and flapping throughout the race:) It also makes for a good souvenir. I did a brief warm-up, learned I had decent kick, and then did a bit of running before the start to keep warm. I lined up in the front row, next to Erik, and the bear we were to “chase”. Or does it chase us? Wait, aren’t bears supposed to be still hibernating this time of year? There was another woman in the front row, some fast guys from Minnesota, and another woman in spandex in the second row. We took off and a bunch of guys passed me on the first uphill. I noted to keep the other front row woman in my sights and easily got in front of her at the crest of the hill. Tiny me, way over on the left side. This photo really shows that it was a small classic race. Me in the foreground, keeping an eye on the chick in green who is at the front of this photo. My goal was to find a pack of men to ski with but within the first three kilometers I had passed back most of the men who had gotten off to a fast start and found myself alone. The skiathlon started five minutes before the classic and so I was passing a steady stream of these skiers as the course rolled. 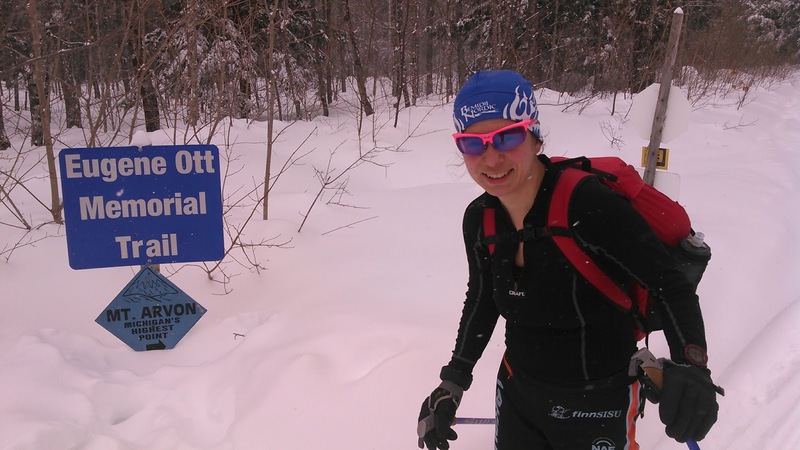 “Go Elspeth, I can’t wait to read about this on your blog!” One of the skiathlon guys said. Admittedly, I didn’t know this guy. I guess that makes me famous?!?!? It had been eleven years since I last did the Great Bear Chase and I’ve only done it twice before- both times skate. I knew the course was fairly flat but checked the course map and profile before the race: a short hill at the start, a bigger hill around 3 km, another hill around 4 km, gradual climb to 7 km, down to 14 km, gradual climb of 300 feet over the next 4 km, then rolling from 18 to 25 km, then repeat (it’s a 2 lap race for the full marathon). That first lap I mostly skied outside the tracks. I thought it was faster, the pole plants didn’t pencil through on the skate deck, and made cutting the corners easier. 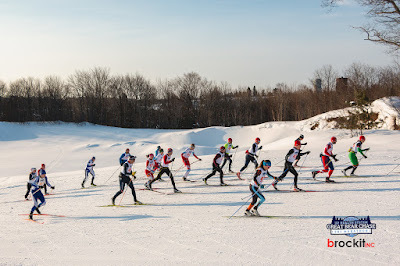 The first four guys in the 25 km classic race passed me- the first one was way out ahead. I took a feed 14 km in at the lowest point on the course and this guy in the classic caught up to me. This was a guy with terrible technique. “Elspeth, you gotta go, go, go, cause you’re NOT skiing with this guy with awful technique,” I told myself and took off. I never saw him again. From here the course climbs quite gradually. I did some striding, trying to save my double pole muscles for the second lap. The fast 50 km skate guys passed me having started 15 minutes after me. I briefly tucked in behind a pack of skiathlon guys, then passed then. I was enjoying that first lap until the last 5 km or so when the reality sunk in that I still had another 30 km to go. Could I maintain this pace? 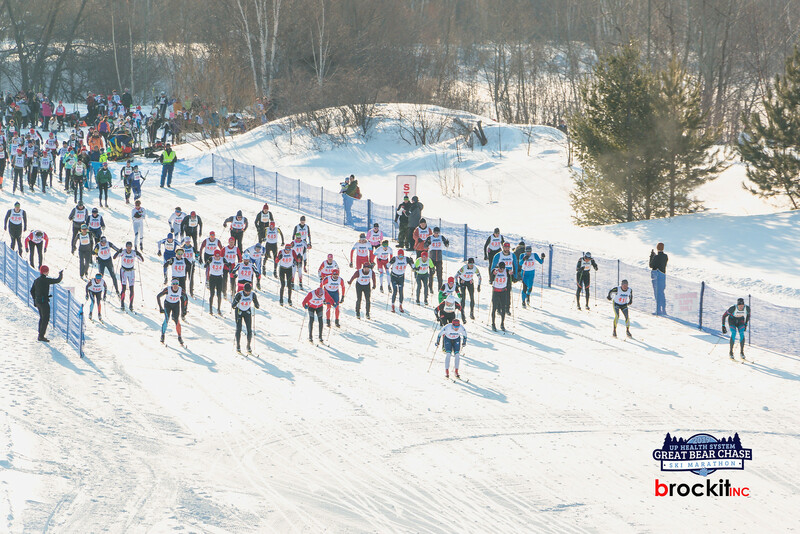 I just about caught one skiathlon woman before I headed out on my second lap. 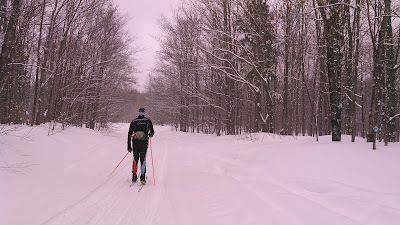 I was again alone except for the 50 km skate and skiathlon skiers (now on their skate lap) passing me in a steady stream. It’s easy to feel bad about my skiing ability when being constantly passed but I tried to tell myself I was doing the slower technique and the fact that no other classic skiers were coming up on me was a good sign. While I really enjoyed that first lap, the second lap was a bit more of a sufferfest. Mostly I was bothered by some pain in my right hand from my pole strap and my left glove/pole strap combo which felt like it was too loose. 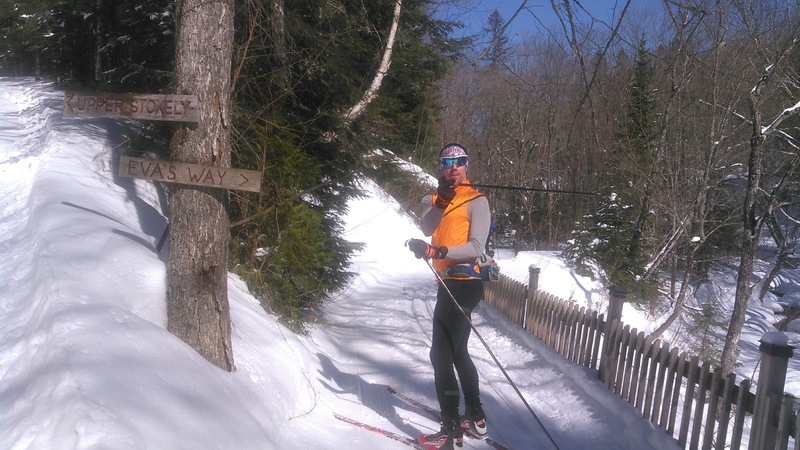 I mostly skied in the tracks but often my outside pole penciled through which is always frustrating. 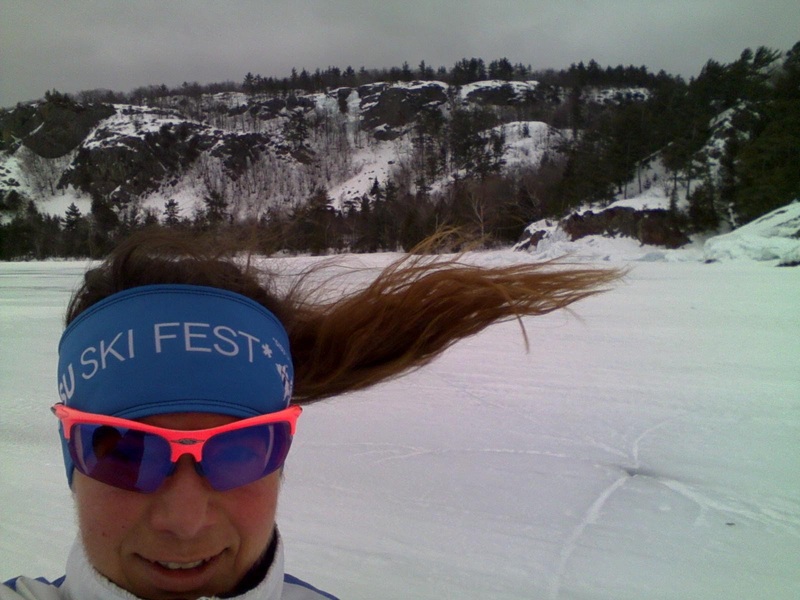 Sometimes I worried that a women would catch me but then I tried to not focus on that- which is wasted energy- and instead focus on skiing as efficiently, strongly, and as fast as I could. I wondered how much ahead of me Erik was (he was also doing the classic) and figured he had 20 minutes on me, or about 5 kms. Then I tried to think about skiing fast. My kick wasn’t terribly good by the second half of the last lap. It was mostly a double pole course anyway and I got really lazy about striding well and often herring bone ran or just ran outside the tracks. The woman I had almost passed in the skiathlon caught me back up (she got behind me after her ski exchange) with around 5 km to go. It was dragging on and I was getting tired. My lower back felt like it was about to seize up with 3 km to go but I wouldn’t let it. I modified my technique to not lean so far forward at the waist. I could still crunch well- maybe that’s how I should always be skiing. I passed up the beer stop but may have stopped had I known they had wine:) Erik took full advantage. My body temperature had been good on the first lap but towards the end of that second lap my legs were getting really warm with the extra layer. I kept pushing all the way to the finish, having not seen anyone else in the classic race for the last 36 km! I assumed I had won but didn’t hear any announcement at the finish and didn’t have this confirmed until the awards ceremony. After hanging out at the finish area for awhile, I ran with Craig to the high school as he was getting late for awards (he was second in the 50 km skate!). I don’t think I pushed quite as hard as I could have in the race because I didn’t feel dog tired running and was easily able to keep up with Craig, even with a back pack on. I ended up skiing 3 hours and 18 minutes which seemed pretty slow. There were only eight women in my race. I managed to finish 9th overall of 45. Not terrible, and definitely deserving of a front row starting spot where there were at least ten lanes tracked wide. I was only 14 and 12 minutes behind the Erik’s [Hendrickson and Pieh] so I’ll take that. If anyone likes a flat course in the woods, the Great Bear Chase is a good one. Plus, did I mention yet that they have the best post race food? 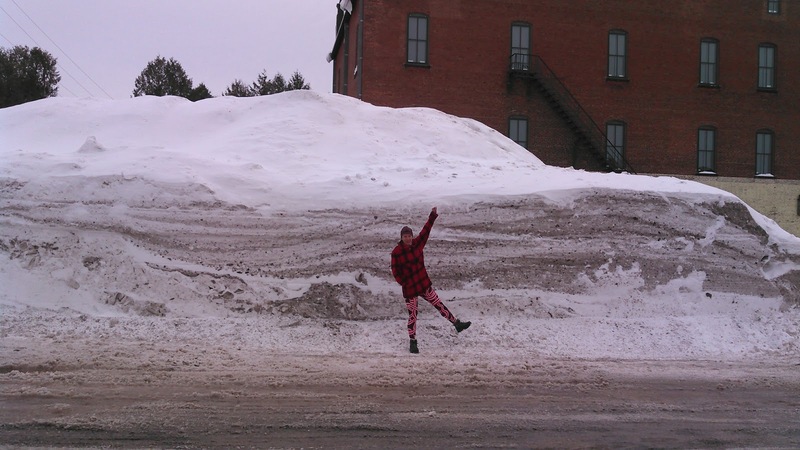 And the snowbanks in Big Snow Country (aka Calumet where the race is located) are worth seeing, too! After the Birkie Skate, I really felt like I needed to train for classic. For lots of classic. 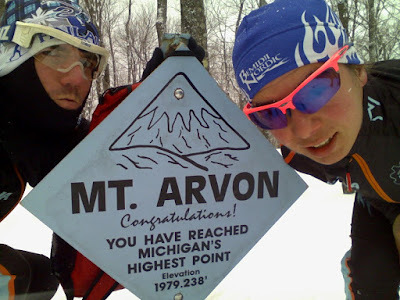 This wasn’t just for the Great Bear Chase, it was so I could feel good enough the day after the Great Bear Chase to do another classic adventure: skiing to Michigan’s State High Point of Mount Arvon. There are logging roads to the top of this “mountain” that are not plowed in the winter. We decided since we would be driving by and wanted more of a challenge than driving to this peak in the summer, we decided to ski there instead. 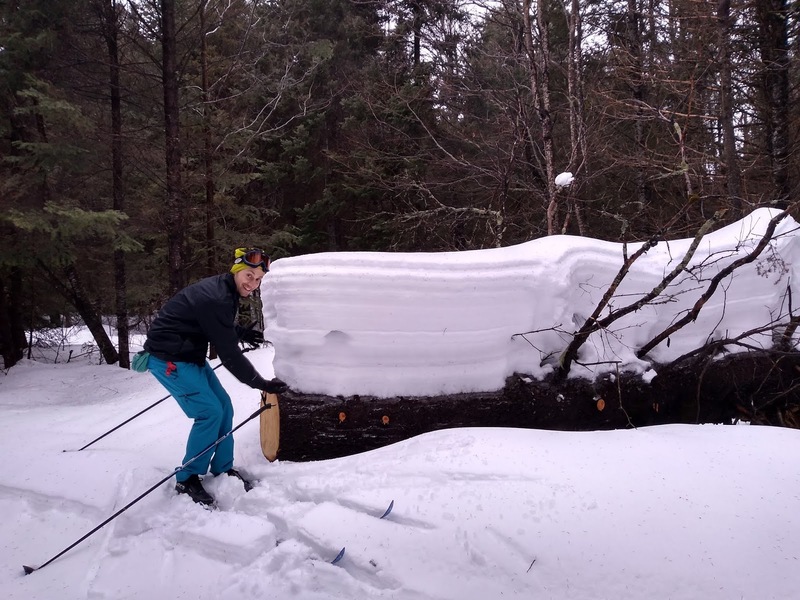 We were able to find some good info on the Internet that the logging trails become snowmobile trails in the winter that we could use. 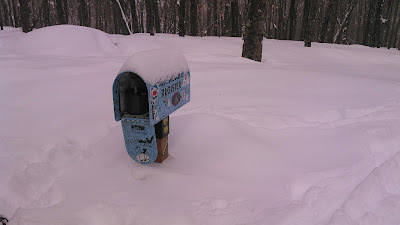 The register box was almost, but not quite, buried in snow. Not a very high state high point. Eventually the trail got steeper and here I just walked. We made it to the summit about 1 ½ hours into the trek. Usually I don’t like climbing mountains when it’s cloudy/snowing, but this summit was tree covered and there was no view anyway and it didn’t seem to be snowing hard enough that it would impede our progress back out, either skiing or driving. From there we made our way farther east to Stokely Creek Lodge, north of Sault Sainte Marie, Ontario. 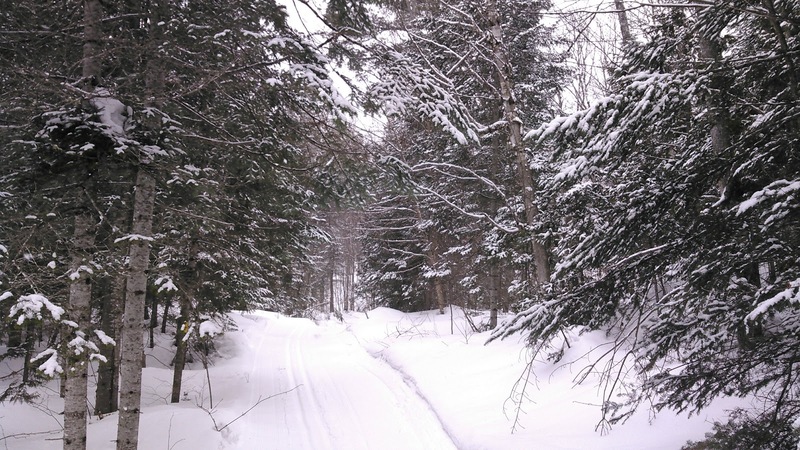 Stokely Creek is an all-inclusive resort with 100 kilometers of ski and snowshoe trails. We spent three nights there getting our fill of skiing, snow, and gourmet meals after meeting some friends who live in Ohio. 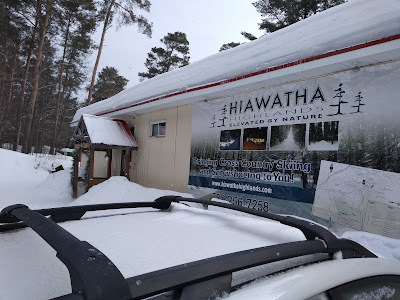 When we arrived, we could either get a snowmobile ride (they do this so there are no road crossings) or ski to the lodge. 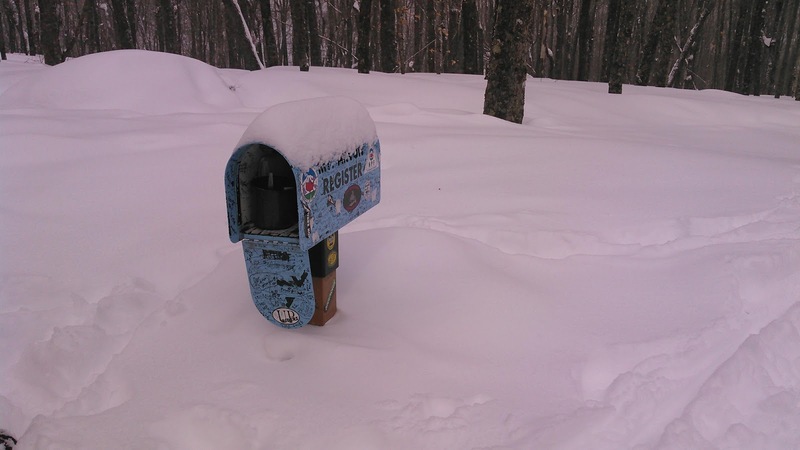 We’re all for using our own legs so we skied to the lodge in a couple trips with all our stuff. This added a bit of adventure! 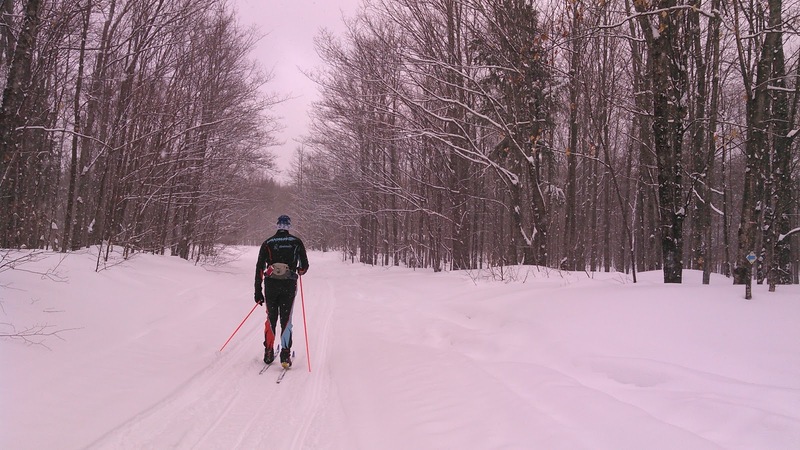 Having arrived in the early afternoon, Erik and I did a skate ski until hors d'oeuvres were served. This ended up being 38 km of hills! 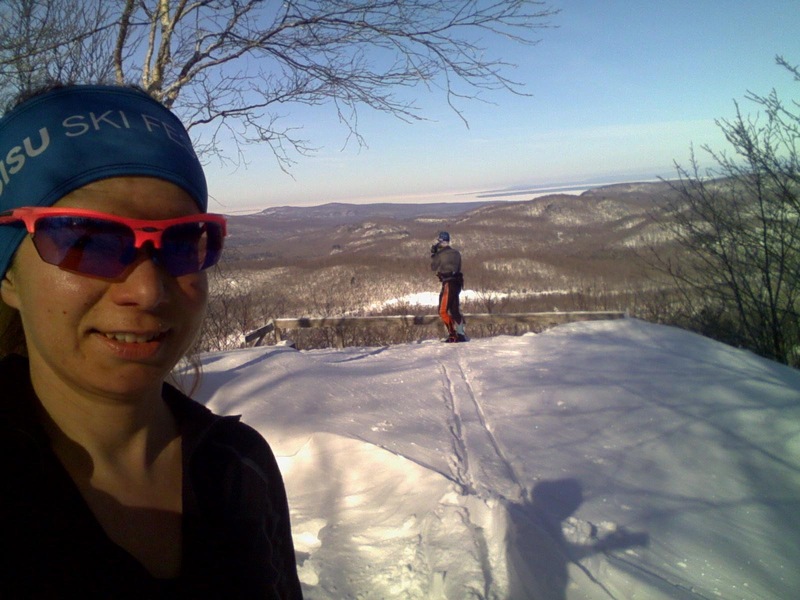 In that ski our net elevation was 2,165 feet which means it is hillier than the Birkie. Stokely Creek is located in the Algoma Highlands, a region of ancient mountains so the terrain is quite hilly and a couple of the lakes are even located in what I would consider “bowls” just like the real big mountains! We skied to the top of King Mountain (1000 feet above the lodge) on the sunny day. 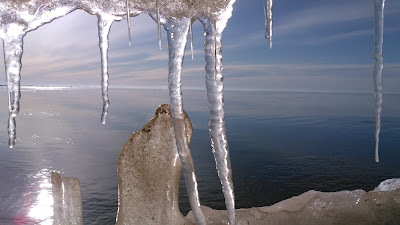 You can see Lake Superior in the background. Starting the penguin walk again. The trail climbed substantially from this point. Eva's Way was one of our favorite trails- single track, pretty flat, along a picturesque river. There were few rolling trails. On one ski, Erik and I spent 15 minutes, twice, penguin walking uphill. Usually I call this herring-boning but for some reason, as I followed Erik up the hill minute after minute, I thought we looked like Penguins. I may also have gotten this idea from the steepest hill on the Gatineau Loppet course which is called Penguin Hill. 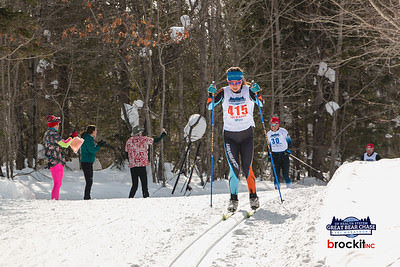 For those familiar with Bearskin Lodge, think Bear Cub World Cup-like terrain on the vast majority of trails. 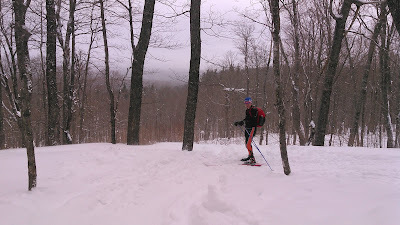 There were a few flatter trails and we mostly stuck to these for one ski but still did 550 feet of elevation gain in 16 km. Stokely Creek attracts quite the repeat clientele whom we met at the friendly common meals. People came from all over but mostly from Michigan, Ohio, West Virginia, and Ontario. 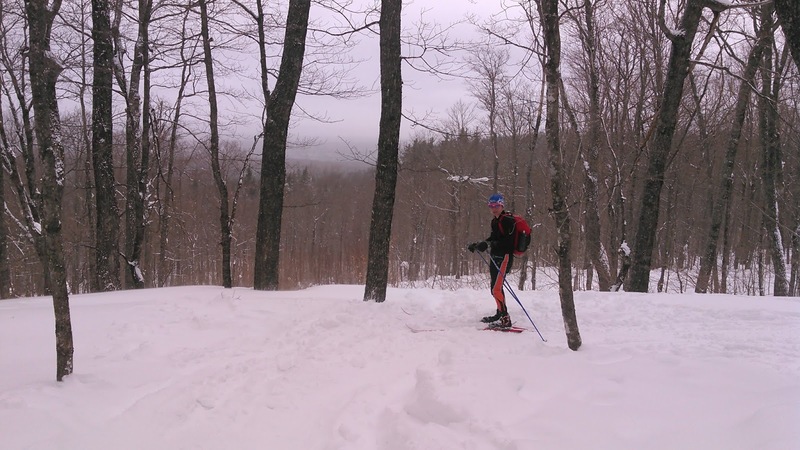 Most of the guests were in their 50s and 60s and non-competitive skiers so it is a bit surprising at their enthusiasm for tackling the long uphill grinders and screaming downhills. We had a good time but given the drive and extremely hilly trails rather than rolling terrain, I doubt we will head back to Stokely Creek in the future. There are just too many more places to explore! We spent our last three nights of the trip at an Airbnb near Sault Sainte Marie, Ontario on the shores of Lake Superior (technically, right at the point where Lake Superior becomes the St. Mary’s River flowing towards the Sault Locks). As such, we decided to go exploring one day. A cold front came through with a howling 30 mph wind. 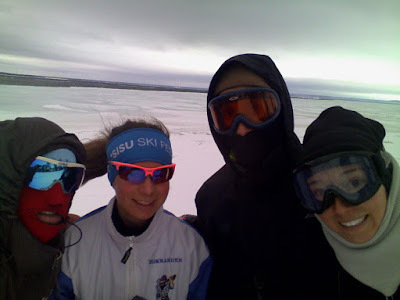 We went for an adventure crust ski but after the rainy conditions, the crust wasn’t quite set up yet. 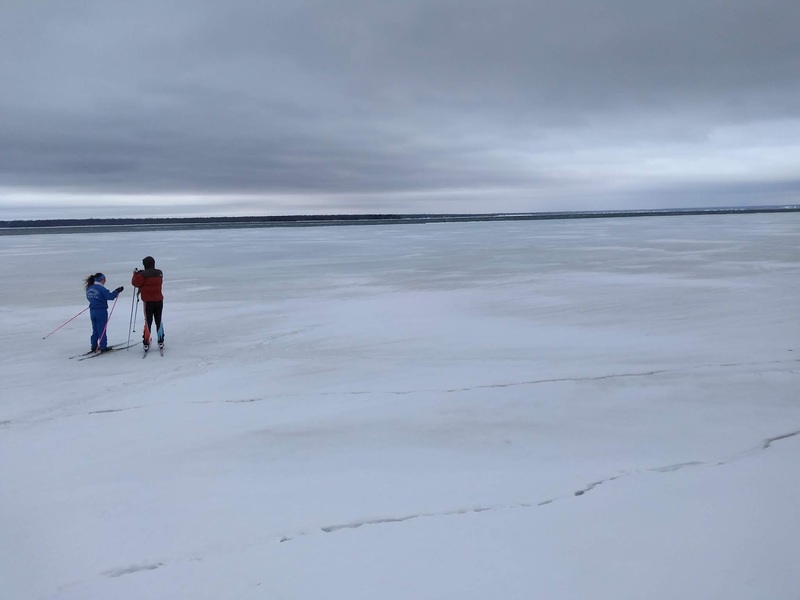 Erik and I skied out on the ice of Lake Superior which was a bit nerve racking since the lake was open and we kept crossing pressure ridges where we could see water below. I maintained that this was relatively safe since we stayed just a few feet off shore where we could likely stand if we fell through and it wasn’t too far back to our Airbnb. Our afternoon adventure was spent hiking at the Gros Cap, a big rock cliff. A selfie at the Gros Cap. You can see how windy it was by my horizontal hair! 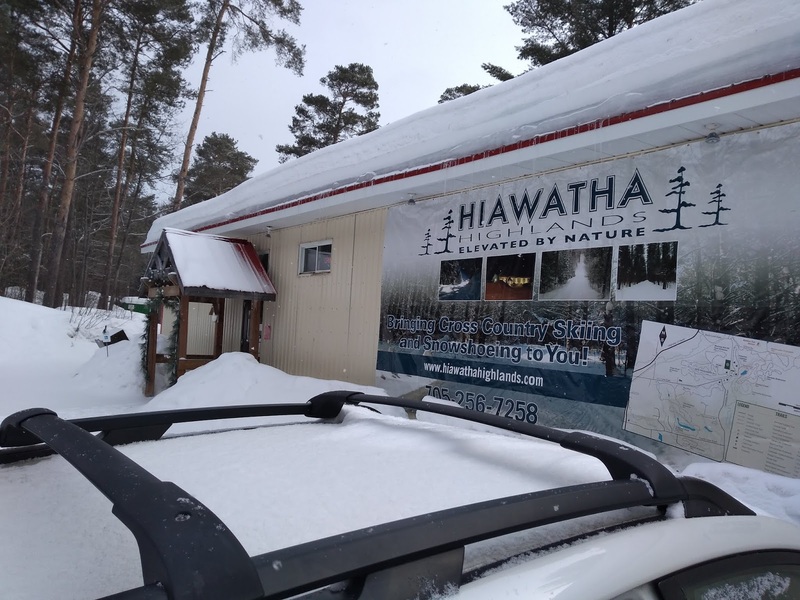 Winter returned for our last day in “The Sault” and we took full advantage of this, skiing every trail at Hiawatha Highlands in Sault Ste. Marie, Ontario. 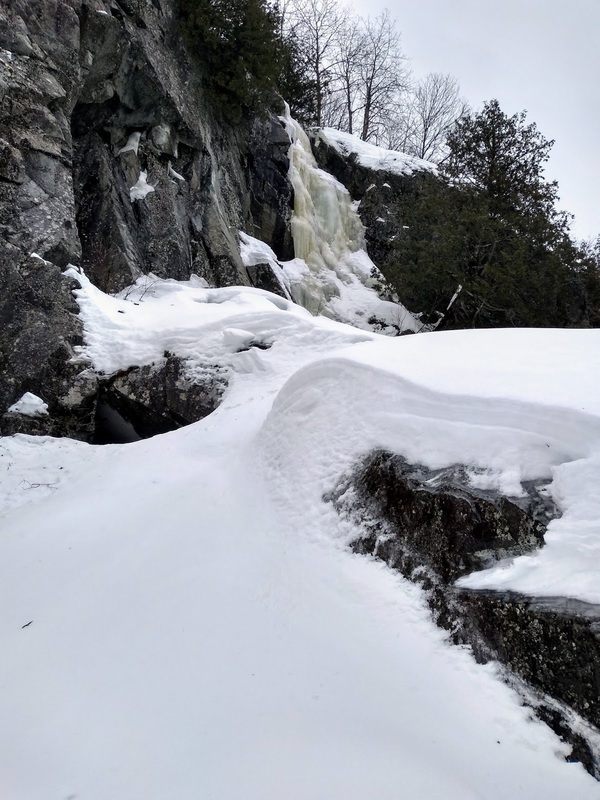 They have an extensive trail network of approximately 40 km. Their chalet warmed my heart, basic but comfortable and incredibly utilitarian. 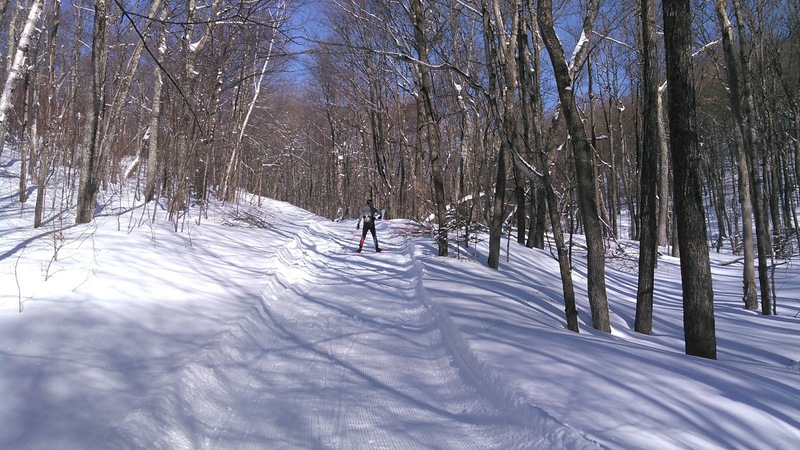 We hardly saw anyone else out skiing and enjoyed the beautiful day with temperatures around 20 ℉. Most of their trails are groomed for classic and skating but they did have one trail that was single track classic for a perfect backwoods feel through the forest. This ski area is a definite must stop for anyone passing through the area. 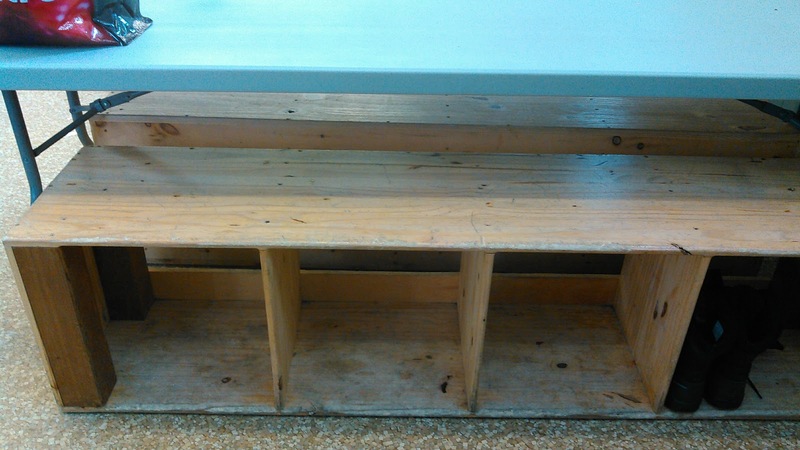 The utilitarian benches/stuff storage combo at Hiawatha Highlands. 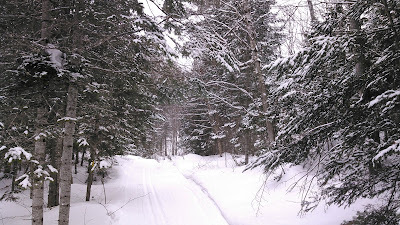 Beautiful winter single track trail at Hiawatha Highlands. Over 8 days we skied about 280 kilometers. Not bad for mid-March. We drove 9 hours back home on Sunday but were able to get out for some brief exploring on the shores of Lake Michigan. 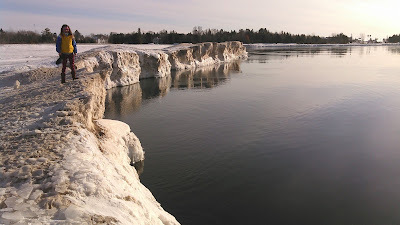 The interesting ice wall on Lake Michigan on the beach in Manistique. 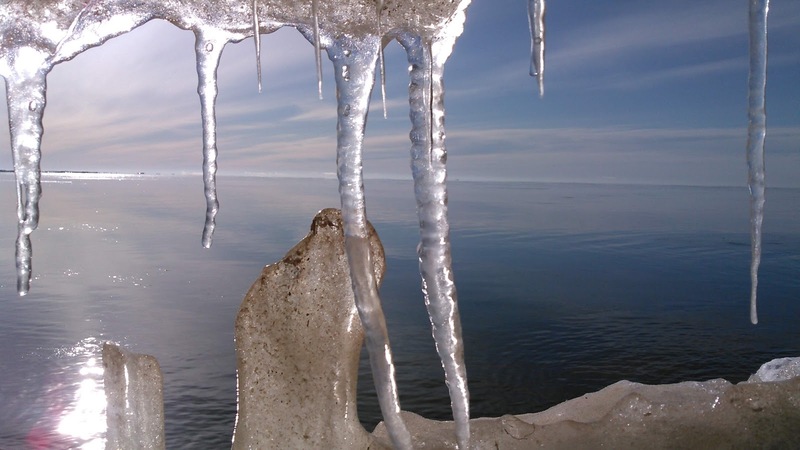 Looking out at the lake from an ice tunnel. 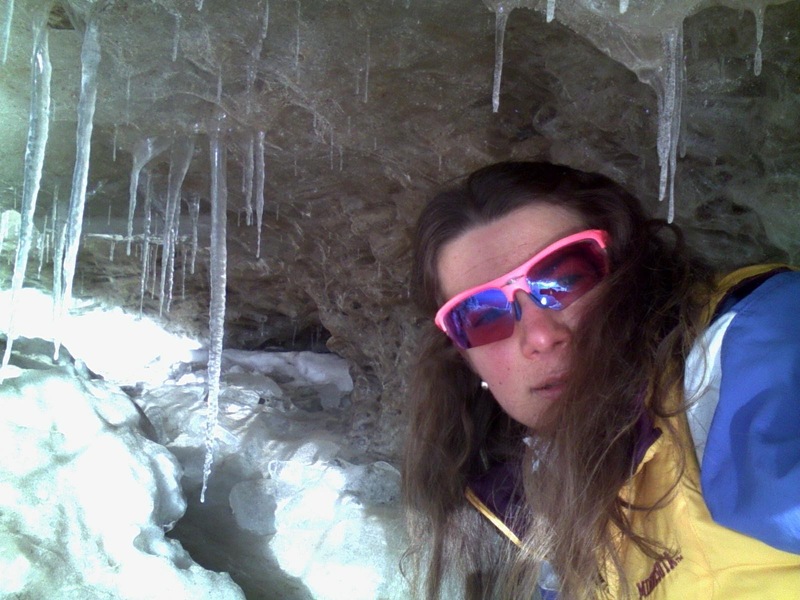 Selfie in the ice tunnel.